Posted on January 25, 2017 at 12:00 pm. It would be impossible to have a conversation about history’s great method acting legends without mentioning Heath Ledger. The acclaimed Australian actor rose to fame in the late 1990s and over the next decade, he went on to receive high praise from film fans and critics around the world. Heath Ledger starred in an incredibly diverse array of films during his career, and won a huge amount of prestigious awards in the process. One role stood out from the rest and that was also, tragically, his last. This was, of course, Heath’s performance as The Joker in the 2008 superhero thriller, The Dark Knight. Heath’s dedication to this character is possibly the most famous example of method acting in film history. The final months of his life were devoted to the character of The Joker, something that clearly paid off as this ended up being one of the most critically acclaimed film performances of all time. After his tragic and untimely death, this incredible display of acting earned Heath the extremely rare posthumous Best Actor Academy Award. Heath Ledger was famously committed to the method and used method acting techniques for every role he undertook, one of the most important aspects of which is character research. In fact, it is possible that one of the reasons that his performance as The Joker was so groundbreaking was the sheer amount of time he had to prepare and research for the role. Director, Christopher Nolan, cast Heath before the script had even been written. This meant that he had an unusually long amount of time to obsess over his character, conduct thorough research and get to know and create a back story for The Joker in an unprecedentedly detailed way. Apparently, Heath’s character research included isolating himself, beginning an in-depth character diary (which we’ll talk more about later on) and studying other bodies of work which depicted psychopaths similar to The Joker. Christopher Nolan said that Heath closely read A Clockwork Orange by Anthony Burgess and studied the painting of Irish artist, Francis Bacon. When asked about his preparation process and how he got into character for his role in The Dark Knight, Heath himself said that he locked himself away in his London hotel room for around a month, writing a character diary and constantly experimenting with different voices. It was extremely important to Heath that he created a truly iconic voice and laugh for The Joker, something that anyone who has seen The Dark Knight will agree, he definitely achieved. Method acting techniques teach actors how to draw on their own real life experiences, memories and emotions, and use them to whatever role they are playing. Heath Ledger was fully aware of the importance of seeking his own emotional awareness and applying it to his performance as The Joker. After conducting all of his in-depth character research, Heath had created a deep and fully dimensional character that he could get under the skin of and understand. This allowed him to become that character for the time that he was filming, and meant that he could invoke the most natural reactions and mannerisms possible. One of the biggest myths about method acting is that performers have to stay in character at all times. In fact, every performer is different and must utilise method techniques in the way that best suits them. Heath Ledger remained in full costume and make-up all day every day during production of The Dark Knight; however, he did not remain in character. Instead, he would keep the character diary close to hand and when it was time for the cameras to start rolling, he would consult this journal in order to get straight back into the mindset of The Joker. Of course, The Dark Knight is not the only example of Heath Ledger displaying legendary levels of method acting skill. He also won multiple awards for his trailblazing performance in the 2005 romantic drama, Brokeback Mountain. Director Ang Lee was completely blown away by Heath’s dedication to this role and has been quoted as describing his preparation as “really deep”. Ang even went so far as to say that the actor kept his teeth clenched and his face scrunched up for around two months, and that he refused to let go of the character. During this time, Heath also became very deeply immersed in the gay rights movement. One anecdote about the filming of Brokeback Mountain came from Heath’s co-star, Anne Hathaway. She played Jake Gyllenhaal’s wife, Lureen, in the film and has been quoted talking about the incredible devotion Heath Ledger had for the script and for his character. So he ended up punching the brick wall with all his strength. Anne would go on to describe this scene as the moment she realised that Heath Ledger was one of the greatest actors that has ever been. This is an incredible example of just how much raw emotion actors can process when they use method techniques such as affective memory and sense memory in their performances. There is no question that Heath Ledger has made a name for himself as one of the most iconic and celebrated actors of all time. He is a perfect example of someone that all new actors in training should aspire to emulate. 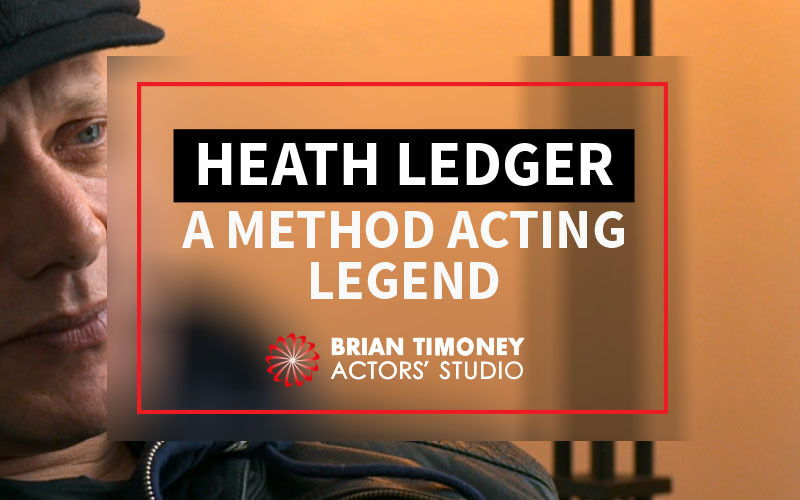 If you’re inspired by Heath’s legendary performances, then you will need to study the method for yourself. 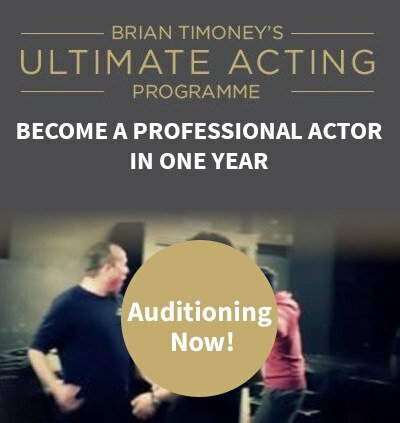 Brian Timoney Actors’ Studio offers world class tuition on method acting to suit every student’s availability. Whether you opt for the weekend Method Acting Boot Camp or the year long Ultimate Acting Course, you will learn everything you need to know to use your emotions and senses and transform them into a genuinely convincing performance in the same way that Heath Ledger himself did. We can help you master the method and show you the ropes in the acting industry so you can get started pursuing your dream of being a professional actor. If you have any questions or would like to find out more, please don’t hesitate to get in touch today.